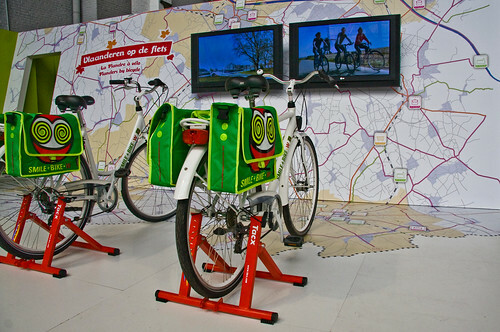 Our friends at Cycle Chic Belgium have had a successful campaign worth mentioning. Through their Met Belgerinkel naar de Winkel- campaign, or Ring your Bicycle Bell to the Shop they were encouraging people in Flanders to ride their bikes to the shops, instead of taking their cars. The Belgian designer Walter Van Beirendonck had designed a pannier bag and the campaign, which ran from May 16 to June 20, 2009 managed to get 175,000 people to choose the bicycle to go to the shops. And part of the campaign was a discounted price on the pannier bags. A whopping 16,500 people ordered one. A cracking result. 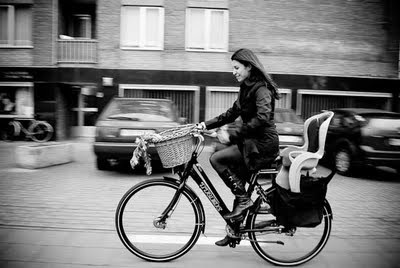 Well done, Cycle Chic Belgium! Promoting cycling positively and a role model for bicycle advocates everywhere. ". . .managed to get 175,000 people to choose the bicycle to go to the shops . . . A whopping 16,500 people ordered one." Although it does leave me wondering if it's possible to spray paint panniers flat black. What can I say, but "There's no accounting for taste"? It will still be a wonderful thing if even only half of them end up getting used on a regular basis. Not my taste but if they ride, they ride.